Although this a beauty-ish post I thought I'd post it on here because I think it's a bit more relevant to this blog. 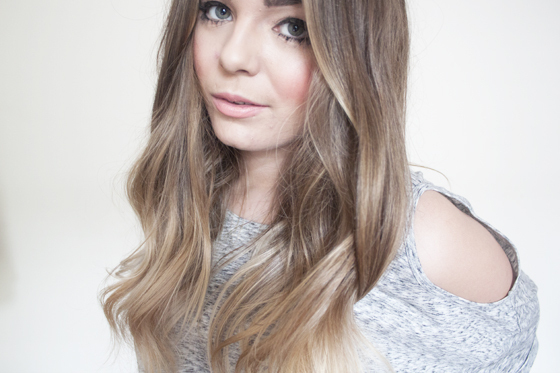 One of the defining features of my blog for the last two years has been my ombre hair. As I mentioned yesterday, I decided I needed a hair refresh. There was nothing really wrong with my hair I wanted a style update. My stylist cancelled on me so I contacted Lisa Shepherd London Salon about possible getting my hair done there. I've been thinking about changing my hair for ages now, I always say I'll go blonde or I'll get rid of the ombre but never have done. I've had the idea in my head that I wanted to be blonde, but also be a brunette at the same time. So keeping the ombre to a degree but taking away the harshness, the orange tinge and blending it much higher for a more sun kissed look. 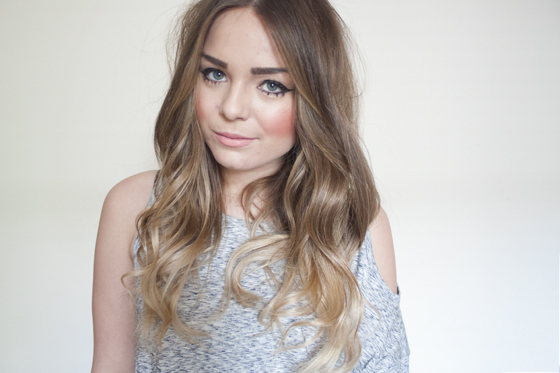 Personally I think ombre/dip dye is getting a bit passé now so I just wanted to update it ! I was lucky enough to have the Salon Director Jason Cocking doing my hair. He's done loads of celebs hair including my fashion/hair idols Mary Kate and Ashley Olsen! 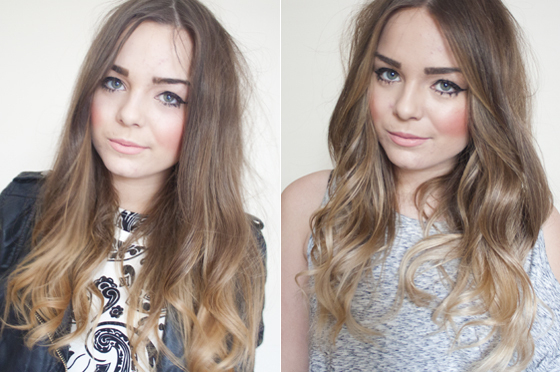 I explained I wanted to get rid of the harsh dip dye look, and have a more sun kissed blended look instead. I said I wanted a more caramel blonde at first but Jason suggested I go for an icier cooler beige blonde instead as it would suit more. He also mentioned I get a fringe cut it, not as in a block one but shorter bits at the front to frame my face a bit more. I was so worried about this because it has taken me so long to grow my fringe out. Fun Fact, I had a straight fringe when I started this blog, so its taken 3 years to grow it out. Other than that I just wanted a trim and a neaten up around the ends of my hair. Not taking too much of the length just getting rid of some of the dead ends. He bleached my hair using the Lisa Shepard Tonal Fusion method. This basically involves a bit of balayage and backcombing to achieve a much even blend. I love the way this works as it really does give a lovely smooth faded effect rather than the harshness of my old DIY jobs! He took the dye right up around my face to lighten it up rather than take it all the way to the roots. As my brows are dark he said he didn't want to take away the darkness around my face as it suited me, just run some colour around the front to frame it a bit more. I can't recommend the Lisa Shepherd Salon enough, I've had my hair done there before in the past and loved it as well as attended a few events. I left the salon feeling very happy with my hair and a big smile on my face! Which for a hair dresser phobe like me is always a good sign! I actually looked into getting my hair done at Lisa Shepherd after someone mentioned on twitter (sorry I can't remember who! Please speak up if it was you!) Mentioned that Groupon currently have an offer on for Lisa Shepherd London for £59 which equates to 74% off a Half Head Highlights or Full Head Colour Plus Cut, Conditioning Treatment, and Blow Dry. Which personally I think is an absolute bargain for a salon in Central London, It's about 5 minutes walk from Oxford Street tube station and Goodge Street. Personal Disclaimer: While I did get my cut and colour for free. I really do highly recommend the Lisa Shepherd salon and their Tonal Fusion technique. All opinions are my own. 100% Truthful as always. This is beaut Lily! Looks much healthier and brighter! i am in love with the colour of the tips, such a gorgeous colour! it looks lushhh and perfect for summer! Love it! The colour is so so nice and the shorter bits at the front really do suit you and frame your face! Your new hair color looks so beautiful and chic! this is amazing! so glad you didn't get rid of the ombre completely, i still love it! I chuckled reading this because you said I think ombre/dip dye is getting a bit passé. I live in America and its barely coming to the scene here in the streets! Looks soo much healthier, really happy for you! Check out my blog, I've just started blogging again! Wow, I wish I had hair like you. Mine is thin and flat and blah. This looks awesome, I love the lighter/softer colour. Do you know how much it would cost to get done (colour and cut)? I love your hair! So beautiful! It's gorgeous! I like how it's not too ombre anymore and more blended, it looks very natural & lovely! XO. wow i think this is a great modern update. it is a subtle ombre like you said. looks mature and really suits you. You look beautiful! This colour really suits you, it looks so effortless and perfectly ~beachey. What a great hair update, it almost makes me want to go back to blonde! This looks so polished, sounds like a fab salon! Your hair looks absolutely stunning! Your hair looks fab, loving the icier blonde, and the slightly shorter layers, think I could do with taking a trip to that salon!! Wow that is such a great price and sounds like a really good salon. Yeah they did an amazing job. Had my hair cut as well there. I did not like it. But i think they did an amazing job on you! Your hairs looks gorgeous I love how well it all blends and he colour. How do you style your hair? I love the subtle curls. I've been growing my hair for over a year now and have just got it to a long enough length to start learning new styles. This is amazing, it looks so fresh and healthy! Your hair looks lovely and I like the sound of the method they used to bleach your hair. ah, it looks beautiful. the colouring looks seamless. quick question: did you use your totem styler to get the waves or is this fresh from the salon? if you used the first option, could you tell me what setting you had them on, as your waves look perfect! Looks lovely! It's nice that you've still got the ombre too, it's just a lot more subtle. I really like mine, god knows what I'll do when I get bored of it. I'd love to go blonde all over but it'd look horrific! Your hair is drop dead gorgeous! Love it. I am wanting to go ombre but I am a little worried about it looking a tad brassy but this looks so so natural and stunning! if you go to a hairdressers just make sure you ask them to tone it to the colour you want! Love the hat. Such a great look! And your hair looks wicked, really natural looking. You have beautiful hair so jealous! i love your hair!!! i'm jealous as well haha! your hair look is amazing. Thanks again another new post. Love this! I've just had mine done in the Salon and it is soo much better! It was good to see your new hair dye you have done from Lisa Shepherd Landon Salon; I like to admit that they have done a good job.